I was born and raised in Southern California and have been a Legionary of Christ for two years. I am currently studying Classical Humanities at Legion of Christ College in Cheshire, Connecticut. 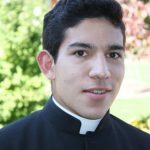 I entered the Apostolic School in Leon, Mexico in 2009, and after graduating High School, entered the Novitiate of the Legionaries of Christ in Cheshire. I consecrated myself to God as a Legionary religious in September 2017. I am looking forward to leaving to Rome in August to begin my studies in Philosophy.